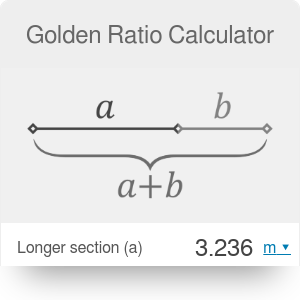 The golden ratio calculator will calculate the shorter side, longer side and combined length of the two sides to compute the golden ratio. Before we can calculate the golden ratio it's important to know what is golden ratio. The following section will explain this in detail. The golden ratio, also known as the golden section or golden proportion, is obtained when two segment lengths have the same proportion as the proportion of their sum to the larger of the two lengths. The value of the golden ratio, which is the limit of the ratio of consecutive Fibonacci numbers, has a value of approximately 1.618. The formula for the golden ratio is as follows. Let the smaller of the two segments be a and the larger be denoted as b The golden ratio is then (a+b)/a = a/b The golden ratio calculator is handy to compute this ratio, as well as any ratio calculator. Here's a step by step method to solve the ratio by hand. The golden rectangle is a rectangle with a length of a+band width of a. This rectangle is often seen in the arts, as it has been said it's the most pleasing to the eye of all such rectangles. The golden rectangle calculator is a convenient way to find the golden rectangle instead of working it by hand. Golden Ratio Calculator can be embedded on your website to enrich the content you wrote and make it easier for your visitors to understand your message.